WILLEMSTAD - the Antwerp Company Oilchart International, which blends marine fuels (bunkers) and supplies them to shipping, denies that it has not worked according to the rules in the case of imported oil from Curaçao. That reports the Gazet van Antwerpen. The company feels strengthened by a decision of the prosecutor's office in Antwerp not to start a legal case against them. Since 2012, Antwerp Oilchart International has been working on the remediation of the Asphalt Lake on Curaçao. This originated at the time of the Second World War when Shell produced large quantities of kerosene. A by-product of this was asphalt, which consists of oil, accounting for more than a million tons. By clearing that 'asphalt lake', the Buska Bay in Curaçao would become free of asphalt after eighty years. Oilchart states that it is part of the company's efforts to contribute to the circular economy. The central question here is whether the oil in question must be regarded as a waste material, or can be used as a raw material. In concrete terms, the Antwerp bunker cooperated with the local company Asphalt Lake Recovery (ALR) to clean up the lake. ALR was appointed by the local government for this cleaning. ALR added lighter oil fractions to the oil, so the oil met the official American standard for 'fuel n ° 6'. The company sold the oil to Oilchart, among others. Oilchart then transported this oil to Europe by tanker. That is the official statement by Oilchart. Once in Belgium, the oilchart substance, after the oil had been analyzed by an independent party, was either further processed or sold to other European refineries. In total there would have been about ten transports between 2012 and 2015. Oilchart emphasizes that all products sold in this way comply with the legal specifications. In 2014, there was a discussion about the stocks in the port of Antwerp with the environmental inspectorate. He drafted a report for alleged environmental crimes, including the mixing of hazardous waste with other waste materials. The oil would have been used as marine fuel, but it would not be in conformity with the norm. The company denies the latter. It points to a number of decisions by various governments, such as a ministerial letter from January 2015. That decision was prepared by its deputy chief of staff and indicated that the "imported oil is considered as a raw material", enabling Oilchart to continue working with it. To justify the transports, Oilchart also refers to a decision of the Public Prosecution Service. 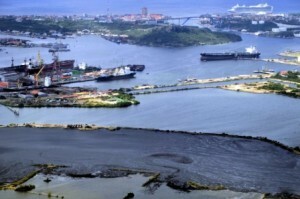 In 2014, the environmental inspectorate had drawn up an official report for the import of the oil from Curaçao, arguing that it would be a waste. The Public Prosecutor has decided not to prosecute Oilchart. As a result, the Environment Enforcement Department of the Ministry of Environment could impose an administrative fine itself but decided not to do so because the oil is not waste if it was useful to Oilchart and there are no specific technical requirements for this imported product so that there can also be no infringement. The Flemish waste company OVAM also informed the bunker company that the decision from the Cabinet to regard the oil as a raw material is "honored". But the issue sparked a discussion between the OVAM and the Cabinet, which has still not been clarified: OVAM maintains its fundamental position that a so-called 'raw material statement' is necessary. This is an official permission from OVAM to conditionally still use waste as raw material. Oilchart points out that in the meantime the transports have been shut down since 2016, because, according to the bunker, the "persecution policy is keeping the climate in Belgium and the Netherlands legally too uncertain, even though these products comply with all legal standards". What the judicial investigation will yield is difficult to predict in advance. Oilchart said that it regretted that it could not further contribute to the remediation of the Asphalt Lake due to the legal discussion.